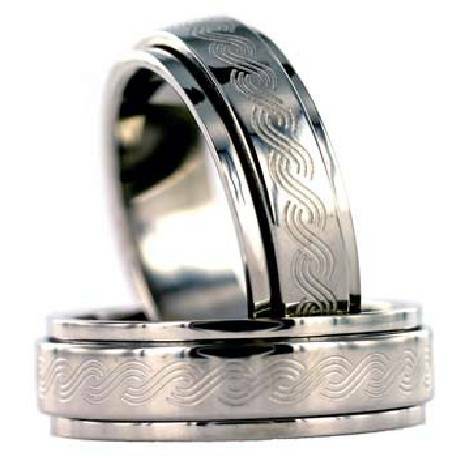 Stainless steel ring featuring a three line wave pattern around the length of the ring. Stylized pattern is subtle, great for an every-day ring. We ordered the size 14.0, which is what the jewelery store sized my fiance as. It fits perfectly. The spinner is very smooth. After the first night, it was a touch rough, but after spraying it with WD-40, and spinning it repeatedly for about 2 minutes, we were able to clean off the surface of the ring, and it's been smooth again ever since.